How will the new Pentagon strategy affect future military tech? In early January, President Obama announced a new strategic direction for the U.S. military, slowing defense budget growth and shifting the military's focus to new threats. The novel strategy will shape military spending for years to come. How will it change the shape of future defense technologies? The new strategic initiative, titled, "Sustaining U.S. Global Leadership: Priorities for 21st Century Defense," includes a number of key changes in defense policy. The most attention-grabbing change is the slashing of projected budget growth in the coming years. While hawks decried the "budget cuts," the real dollars in the current defense budget aren't being cut at all. Preliminary budgets based on current levels of budget growth (which are unprecedented) were trimmed to accommodate slower growth. The defense budget will still grow year-by-year. This is all complicated by a separate budget-cutting effort , part of the Congress' Budget Control Act, known as sequestration. The bottom line is, the Pentagon is going to have to make do with less cash than they'd hoped for in the next ten years. Obama also called for the military to shift focus toward Asia while still keeping a sharp eye on the Middle East, specifically calling out Iran and China as antagonists the U.S. will need to deal with. Since future conflicts seem unlikely to involve large scale ground battles, the Pentagon will end up "streamlining the ground forces, particularly the Army, while relying more heavily on Special Operations troops and hi-tech weaponry, including unmanned attack drones." Military research and development is a huge driver of applied technology, so we can expect a major shift in Pentagon strategy to affect future tech. What can we expect? Budget cuts and troop drawdowns mean military forces will have to get more accomplished with fewer human troops. Unmanned Aerial Vehicles (UAVs) are pretty inexpensive compared to the overall cost of human pilots, and they can stay on mission for extended periods, making them an economical choice for reconnaissance and even air-to-ground assault. Look for continued development of UAVs, with larger planes capable of a wider range of missions, armed with more accurate and powerful weapons. They probably won't run on any kind of AI system, however – human "pilots" controlling the UAVs from the ground are still cheaper than developing that kind of technology. Development of mechanical suits that amplify the wearer's physical capabilities is surprisingly far along. While large scale ground forces are de-emphasized by the new Pentagon strategy, there will always be a need for some troops on the ground. With a leaner budget, troops will have to push farther, work longer, carry more stuff and do more jobs than today's soldiers. 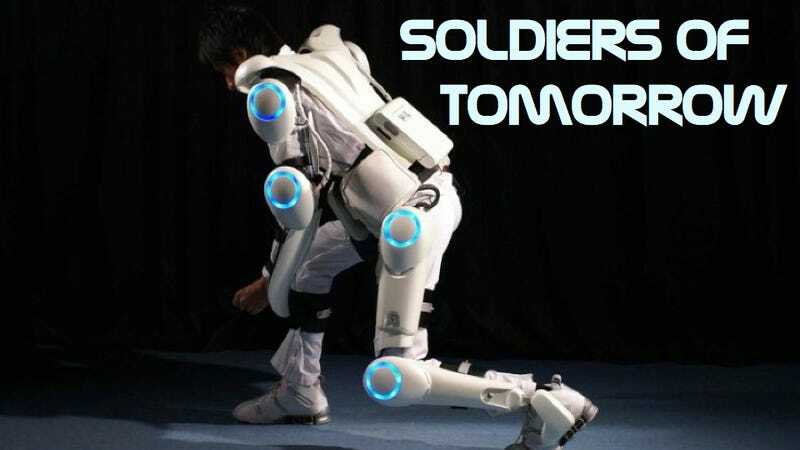 One of the ways to help them do that is with wearable exo-skeletons. Current models are focused on supporting heavy cargo loads while a soldier is on the march, reducing the work the human needs to do. It isn't difficult to imagine future versions achieving the efficiency necessary to add armor and on-board weapons. A limited, non-flying Iron Man could very well march onto battlefields in a decade or two. Consider also how life-changing this technology could be for veterans who have suffered amputation or paralyzing injuries. Along with pushing troops harder, military commanders will stretch budgets by keeping soldiers alive and healing them quickly, even right on the battlefield. To that end, we may see emphasis on development of synthetic blood with a longer shelf life, a crucial aspect of battlefield triage. Meshes, wraps and other devices that can be quickly and easily applied to skin to protect and heal burns will be important as well. This is the kind of technology that could, eventually, lead to nanomedicine – molecule-sized robots that can be injected (or just live inside a soldier), travel to injury sites, then diagnose and begin treatment, including application of pain relief and infection fighting medicines. An intermediate step could include patches or implants that release coagulants and other drugs in response to specific changes in physiological metrics like heart rate and body temperature. "Our strategic challenges will largely emanate out of the Pacific region," said Chairman of the Joint Chiefs of Staff General Martin Dempsey when the new strategy was announced. Projecting power into Asia requires a strong Navy. The ultimate in U.S. force projection has always been the aircraft carrier, so today's Nimitz-class nuclear carriers will see heavy work in the coming years. They're set to be replaced by Gerald R. Ford-class carriers, the first of which should be deployed in 2015. The new carriers are more efficient than the Nimitz carriers in a number of ways, including requiring a smaller crew. However, not counting development costs, each one will cost in the neighborhood of $8 billion. Decommissioning the Nimitz-class carriers will cost several hundred million dollars as well. That might lead the Pentagon to research cheaper methods of force projection, including ultra-long-range aircraft and satellite weapons systems. In 2009, the U.S. Air Force folded their cyberwarfare groups into the 24th Air Force, part of Air Force Space Command. The last few years have shown us the damage that informal, loosely organized hacker organizations can do, with targeted "hacktivism" and a near constant stream of financial security breaches. The Stuxnet virus, which targeted and damaged Iranian nuclear infrastructure and is widely assumed to have been developed by the U.S. and Israel, showed that internet warfare is already happening. That the Air Force will use "cyberwarriors" to develop further attacks like Stuxnet is a given. A bigger issue, however, is the cost of securing U.S. infrastructure against enemy-developed viruses. That could cost billions of dollars. One thing's for sure – some element of the strange cold war that's erupting in slow motion between the U.S. and China will occur invisibly, as hackers and security specialists create viruses and security measures in a constant software arms race. Photos: Cyberdyne, USAF, U.S. Dept. of Defense, Berkeley Bionics.